In North Carolina Cal will be facing a team that is unquestionably short-handed. Just how short-handed is unclear. Earlier this month, the school suspended 13 players for at least one game, and some for as many as four. Their sin was selling team-issued shoes, an NCAA violation. That number represents a sizable portion of Carolina's roster, but most of the players were not projected starters, and two of the highest profile offenders, defensive ends Malik Carney and Toman Fox, will serve their suspensions later in the season. They will be on the field Saturday afternoon at Memorial Stadium. The only other prominent player currently suspened is quarterback Chazz Surratt, who played against the Bears in Cal's 35-30 victory a year ago. But he was injured in the ninth game, and, after trying grad transfer Brandon Harris, Coach Larry Fedora eventually settled on Nathan Elliott, who finished the season and will start Saturday. Injuries have also had their impact, although the reports are just educated guesses by the Tar Heels media. Fedora's answer is simply, "I don't talk about injuries", when asked about health issues. Two key players seem to be unvailable because of injuries they sustained during training camp. Running back Michael Carter, the projected starter who ran for 558 yards a year ago is likely out with a broken wrist. In last year's meeting he had 94 rushing yards, including one carry for 47 and another ending in a spectacular touchdown dive. Cal is not sorry he's on the shelf. The defense apparently be without junior tackle Aaron Crawford, who sustained a knee injury last week. The 6-1, 310-pounder has been a big performer in more ways than one. Over the last two years he had started 22 games. In 2017 he was credited with 29 tackles, including five for loss, three of those QB sacks. He also got into the opposing backfield often enough to earn six "quarterback hurries". Fedora, who is in his seventh year as Carolina's head coach,seemingly had the team on the rise in 2015 (11-3) and 2016 (8-5). But a rash of injuries and some defensive breakdowns led to a disappointing 3-9 record last year. The Bears, who had something to do with that, are favored by a touchdown Saturday. Elliott might have won the job anyway, but Surratt's suspension handed it to him. "He's just an all-around guy," Cal coach Justin Wilcox said of Elliott in the Pac-12 coaches conference call this week. "We've got a lot of respect for him. They will have things they like with him a little bit more, every quarterback is that way in terms of the play calls. "He moved the team up and down the field, and that's what you want the quarterback to do, so we've got a lot of respect for him." Elliott, who can also be an effective runner, completed 75 of 146 pass attempts a year ago for 925 yards and ten touchdowns with five interceptions. He started the last three games, two of them victories. "I would say he's better than he was when he left at the end of the season," Fedora told his local media. "He holds himself to a very high standard and if he doesn't reach that standard on a daily basis then he has disappointed himself. He's doing a great job at holding himself to that standard and then raising the level of the guys around him." Elliott has some weapons at his disposal, the most dynamic being wide receiver Anthony Ratliff-Williams (17 above), who doubles as a kickoff return man where he is very dangerous. When senior mainstay receiver Austin Proehl went down with an injury in the fourth game of the year last Fall, Ratliff-Williams emerged as the go-to receiver. Elliott was particualry fond of him. In the three games Elliott started, R-W had 15 catches for 294 yards and three touchdowns. "I’m in trouble, I got pressure, that’s where I got to go," Elliott said. "He’s doing a great job. Not even when he’s getting the ball. When he’s not getting the ball. He’s going to attract people regardless. "He’s a great player, great teammate...I’m really happy for him." Federa said that he makes so many spectacular catches in practice that it has become expected. Aside from R-W though, most of the other receivers are freshmen or sophomores. There is talent at the postition, just not all that much experience. Three wideouts, Dazz Newsome, Beau Corrales, Roscoe Johnson combined for 36 catches and 460 yards as freshmen. Corrales is one of the suspended players sitting out, but the other two are available. Elliott is very high on true freshmen Antoine Greene and Dyami Brown. "They are both very athletic. Both Dyami and Antoine are blazing fast," Elliott said about the freshman duo. "They are going to get down the field and make a play. They have great hands and run great routes. I am really excited and happy to see how far they have come since they have been here. Dyami in the spring and Antoine in the summer, he really picked the playbook up faster than I have seen anyone pick it up. It is really good to see." Although Carter's loss will hurt, the Tar Heels do have depth at running back. The leader seems to be Antonio Williams, a transfer from Ohio State. "WIlliams a power runner with good balance through contact and above average speed and burst to get through to the next level," former Tar Heel player and current commentator Taylor Vippolis said. Jordon Brown. who led the team in rushing last year with 656 yards on 135 carries is the primary backup. Freshman Javonte Williams could also be presed into duty. "We'll play multiple guys," Fedora said. "I think we could probably play up to three running backs throughout this game. As far as how many reps each one is getting, how many carries, how many touches, all those (things), a lot of that will depend on them and what they're doing in the game." The offensive line is inexperienced, tackle Charlie Heck is the only returning starter. The Tar Heels gave up 213 rushing yards per game last year, one of the reasons the defense stayed on the field too long. Losing Crawford certainly doesn't help, but there are some big bodies up front. Carney, Fox and defensive tackle Jalen Dalton are all experienced and caused the Bears some troubles last yeat. "They are a four-down team, an even front team the majority of the time," Wilcox said. "They play a lot of matchup coverage and they are going to get in your face and contest routes. The front four is very talented, their defensive tackles are hard to block, they create a lot of havoc. Those guys create a lot of negative plays." Senior linebacker Cole Holcomb thinks the defensive line is as good as he's seen here, with or without Crawford. "This is the first year where you look at our ones and our twos and we've got some animals up there," Holcomb said. "It's nice this camp because we've just been able to roam around back there at linebacker and just know they're eating up double-teams and making plays on their own. It makes it exciting this year." He is the only returning starter at linebacker, although juniors Johnathon Smith and Dominique Ross are pretty good. Freshman Matthew Flint, a recruiting prize who initally committed to Tennessee, could make his presence felt. "The second level is not as experienced, but they've got talented guys in there," Wilcox said. "The same with the secondary." The Tar Heels lost standout cornerback M.J. Stewart off last year's team, but return safety Myles Dorn, who had two of the team's meager total of seven interceptions a year ago. Dorn and fellow starter at safety J.K. Britt are effective run defenders, but too often they were making the plays down field. K.J. Sails and Myles Wolfolk are a decent pair of corners, and there is some depth at the position. The Tar Heels allowed opponents to complete just 55 per cent of their passes, which is pretty good. Bear foes completed. But UNC allowed 22 passes, the most in eight years. The Tar Heels do have something special in Ratliff-Williams on kickoff returns. He averaged 26.8 yards last year and took two back for touchdowns. 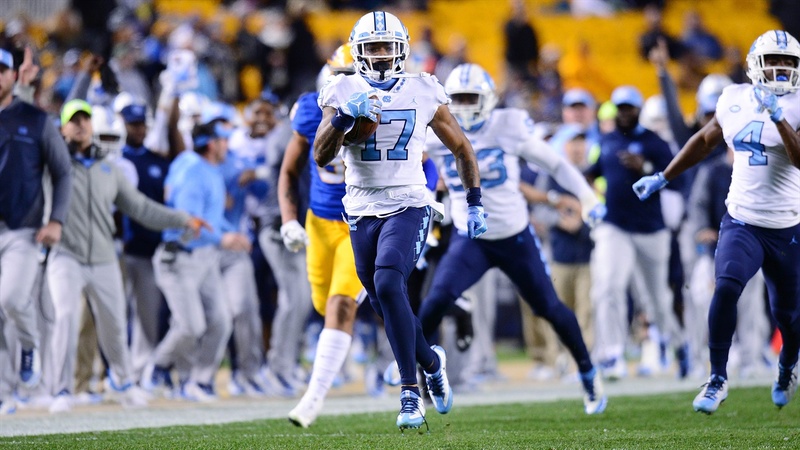 "The thing that makes him a great kickoff return guy is that he is always moving forward and he is going to hit it at full speed," Fedora said. "He is never stutter-stepping in there. He is hitting it at full speed. He makes one cut and he's going. And he's over 200 pounds, so if you are going to tackle him you better tackle him." He wants to return punts, too, but right now that job belongs to Dazz Newsome. Freeman Jones, who made 9-of-14 field goal tries as a junior, will be the placekicker again. Hunter Lent averaged 44.9 yards on 25 punts as a backup last year, is the man this time. Despite the suspensions and injuries, the Tar Heels probably have more healthy bodies than they did at the end of last season. Still depth could be an issue, especially if the weather is warm. Cal probably has superior manpower, but UNC has sufficient big play capability to make a real game of it if the Bears get careless.